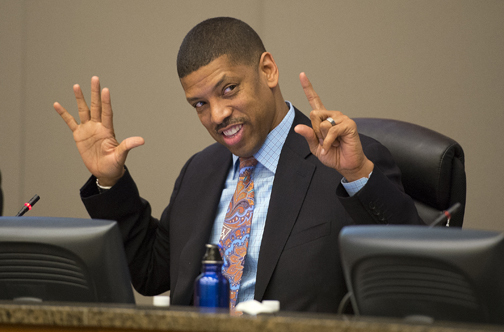 SACRAMENTO, Calif. (AP) -- With the clock clicking down, Sacramento city officials took their last shot at keeping the NBA Kings in California’s capital by approving a public-private deal to build a new 18,500-seat arena and retail center downtown. “We have four billionaires who have said that Sacramento is worthy. It's been a long time since people have validated us in this way,” said city councilmember Steve Hansen, who voted in favor of the deal. The Chamber of Commerce, labor groups and fans spoke in favor of the arena deal, saying that keeping the Kings saves 800 jobs and creates 6,500 more during the construction and downtown revitalization process. “I have a lot of faith in this site. It's nothing short of world class,” said AECOM's Bill Crockett. The arena will be built on the west end of city center on the site of the Downtown Plaza, an aging mall that has lost more than half of its sales revenue in the last 10 years as stores have moved to the suburbs. It’s just blocks from Interstate 5, a short walk from Amtrak and sits at a gateway to downtown and the city of 475,000.